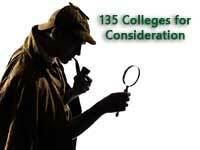 What’s Wrong with These 135 Colleges…and Does it Matter? You may have missed the excitement last May when Ronald Nelson announced he was going to attend the University of Alabama. This was a big deal not because Alabama had grabbed the top football recruit in the nation. It was a big deal because Nelson was actually accepted at all eight Ivy League schools, Stanford, Johns Hopkins, and Washington University in St. Louis. He turned them all down to attend the honors college at the University of Alabama. At the time, his decision caught my eye because of some of the smug, if not insulting, comments made by individuals with a vested interest to promote the superiority of an Ivy League education. Ultimately, Nelson decided to go to the University of Alabama to save money so that he can afford to attend med school. And he doesn’t seem to think that a degree from Alabama is going to keep him from getting his MD. The fact is that there are plenty of colleges and universities where students can get an excellent education while saving some serious cash. Of course, many families worry if affordable colleges will be “challenging” enough or if the student will have intellectual peers. It seems safer, if not more expensive, to go with the “brand name” school. Yet, the thing is that people who are good enough to get accepted at the list of schools Nelson rejected, are quite capable of succeeding anywhere. So why not spend some time looking for cheaper alternatives? So how to get started? Let’s begin with the need for intellectual peers. There are 309 colleges and universities where the 75th percentile test score for the freshman class was at least at the 90th percentile for the test-or almost. For the SAT, the 90th percentile score for Critical Reading and Math was 1310. I used 1300. For the ACT, the 90th percentile was 28. There are 309 schools that have a 75th percentile score of either 1300 for the SAT or 28 for the ACT. That means a quarter of the freshman class would rank in the top 10% of the country in test taking. Yes, I know all of the problems associated with test scores but they’re the same ones that come with college rankings anyway. To continue, of the 309 schools, 137 do not show up in the top 100 of US News Best National Universities or National Liberal Arts Colleges. The question is “what’s wrong with these schools” and does the answer matter to you if they offer significant merit aid? The reality is that there are a variety of reasons why these schools didn’t make the list and each school will be different. Furthermore, just because they didn’t make the top 100 nationally doesn’t automatically mean they are more generous with financial aid. A total of 29 of the schools have an average net price of over $30,000, never a good sign for merit aid. However, 73 of the private institutions have an average net price of less than $30,000 with 15 at less than $20,000. At 83 of the private schools, 90% or more of freshman are receiving institutional aid and 43 of them have average awards of $15,000 or greater. Thirteen averaged over $20,000. Like I said, you really have to look at each school. At 24 schools, 15% or more of the undergraduates have parents taking out PLUS loans for an average of at least $12,000–at least $20,000 for ten of the schools. But students at 48 schools had Median 10 Year Earnings above the average of $42,700 for all schools. The point of this is to show that there is no magic list of schools that will ensure a great fit at an affordable price. However, there are places you can start looking for affordable colleges. The following list of 135 colleges and universities that meet the 75th percentile test scores discussed earlier. The four-year graduation rate is used for private schools, the five-year rate for public.